Callot was from Nancy in Lorraine and spent the early part of his career in Italy working for the Medici family. He developed a distinctive etching style using a tool called an echoppé (a rod with a slashed end). Rotating the tool as it is pushed through the etching ground produces lines of varying thickness, thus effectively mimicking the taper and swell of the engraver's burin as practised famously by the Mannerist engravers, Hendrik Goltzius and his followers. Callot achieved different gradations of tone with the use of stopping-out varnish, so that areas of the plate could be protected from multiple applications of acid. This is not only one of Callot's greatest prints, but one of the most spectacular prints of the century. St Anthony was a Christian hermit saint, who was subjected to various torments while living in the desert. 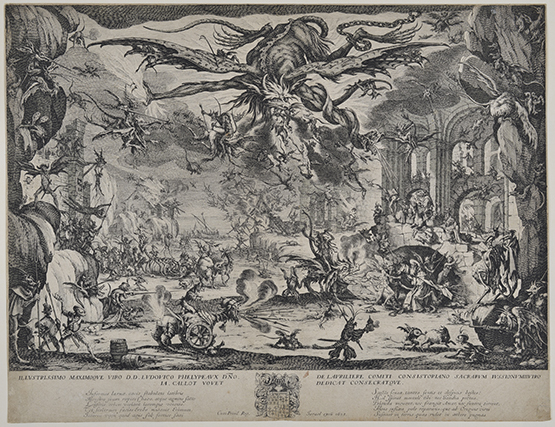 Callot etched his diminutive form in the cave on the right, being physically assaulted by demons, his landscape swarming with demons in the form of myriad wild beasts. Callot excelled in depictions of grotesque figures; this proved particular effective in portraying some of the chilling, sinister scenes he witness after during the Thirty Years War on his journey back to Nancy from Italy in 1621.